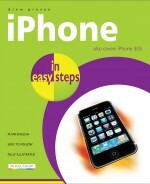 iPhone in easy steps will take you through all the basic functions. You'll start making calls, taking pictures and browsing the web in no time. But this phone does much more. Of course, you can play around with settings, but more often than not, you'll make things unnecessarily difficult. Simply use this easy reference guide to make the most of your iPhone.